In 1924, Sacramento High School in Sacramento, California was suffering from destructive clubs and fraternities. The fraternities were outlawed and moved underground, meanwhile continuing to exercise a negative influence on the student population. Teachers and community leaders of Sacramento High feared the detrimental influence of the destructive clubs and fraternities. These leaders sought a means of replacing the negative groups’ influence with wholesome youth activities. Mr. John Dale, the principal of Sacramento High, and Mr. Frank Vincent, a faculty member, thought their school needed an organization of students who discouraged delinquency by leading through good examples. The first five clubs officially chartered by Key Club International were at Sacramento, Monterey, Oakland Technical, Hemet, and Stockton (now Edison) High Schools. Key Club grew beyond the place of its birth, and a few clubs already existed in Nevada. In 1947, it was decided that a district should be formed. The first step was taken as all Key Clubs and Kiwanis Clubs in California were invited to hold a conference in San Diego in October of 1947. The Key Club California-Nevada (Cali-Nev) District Bylaws and Constitution were adopted and new district officers were elected. John Cooper of Oakland Technical High School was the first District Governor of the Cali-Nev District. The first official Cali-Nev District Convention was held in Oakland in March 1948. It was attended by eighty members representing the 23 recognized district Key Clubs. For more information on these core values, see the Key Club International Core Values Workbook. I pledge on my honor to uphold the objects of Key Club International; to build my home, school, and community; to serve my nation and God; and combat all forces which tend to undermine these institutions. What kind of service projects can a Key Club undertake? There is almost no limit to the scope and nature of Key Club service projects. The Key Club Web site, Key Club Magazine, and conventions all offer ideas for service opportunities. Better yet, begin by looking around your school for existing needs. Are there any minimums for involvement in a Key Club? My high school already has more than one service club. Why should we add a Key Club? What’s the cost for chartering a new Key Club? The chartering fee for new Key Clubs is US $600 and must be paid at the time of chartering.This fee includes the membership pins, cards, handbooks, certificates, a gong, gavel, and banner. How many members are needed to start a new Key Club? Fifteen is all it takes; however, no more than one-half should be scheduled to graduate in the same year. The club membership form asks for member names and mailing addresses. Will Key Club sell or rent these to third parties? Absolutely not! 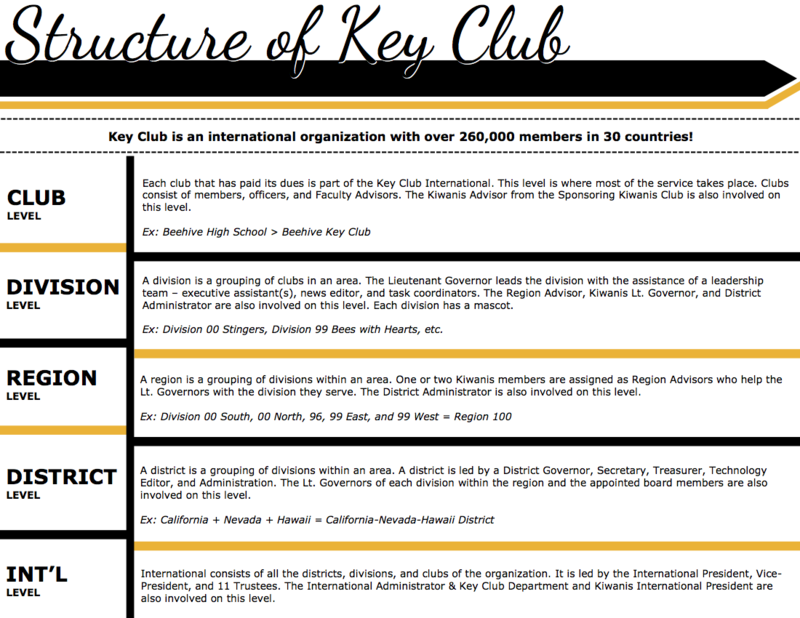 The membership database is for the exclusive use of Kiwanis International's Key Club Department and Key Club International. It will only be used to mail organization and benefit information to members under the control of Key Club and Kiwanis. Can an all-male or all-female club be chartered? In an all-male or all-female school, this is permissible. In a co-ed enrollment, US and Canadian schools are at risk of being in violation of existing federal and state/provincial laws prohibiting discrimination based upon gender. How do I build a new Key Club? With a Kiwanis club in your community, order a new-club-building kit from Key Club International.